Sonoma State University sports update, September 21-27. Women's soccer keeps winning streak alive; men's soccer wins two in a row; women's volleyball wins one, loses another; men's golf finishes in fifth place. Dayna Dolcini and Madison Minton scored the first goals of their respective Sonoma State careers to lift the No. 22 Sonoma State women's soccer team to a 2-1 victory over Stanislaus State on a warm September 25 afternoon at Warrior Stadium in Turlock. The Seawolves have won six straight matches, improving to 6-1-1 overall and 4-0 in the CCAA, and are now unbeaten in their last 17 regular season conference games (15-0-2) dating back to their final regular season contest in 2014. Sara Van Wagoner broke a scoreless tie in the 64th minute off of an assist by Katie Mohr. Mohr wanting to score one of her own crushed one to the net under seven minutes later as the No. 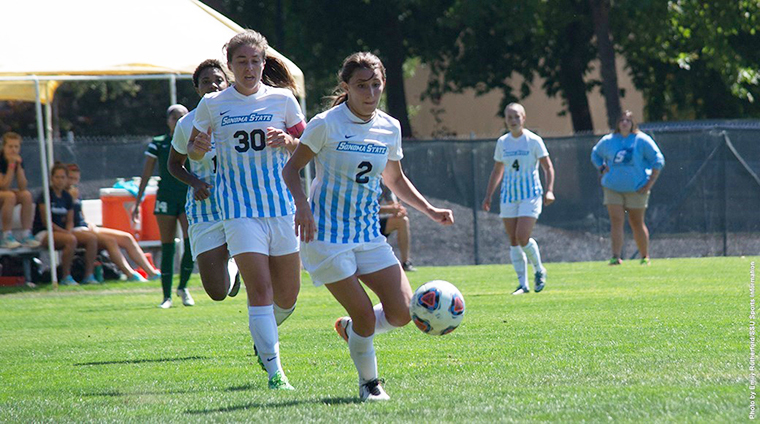 22 Sonoma State women's soccer team cruised to its third straight 2-0 victory, and fifth consecutive victory overall, this time at the mercy of host Cal State East Bay on September 23 in Hayward. Andrew Ogilvy scored two goals and assisted on another, lifting the Sonoma State men's soccer team to a 4-0 blowout of Stanislaus State on Sunday at Warrior Stadium in Turlock. The Seawolves enjoyed a weekend sweep, and have won three of their last four matches, improving to 3-2-3 overall and 3-1 in the CCAA. After surrendering a goal just 53 seconds into the match, the Sonoma State men's did not let the early goal ruin their tempo. The Seawolves rebounded to crush host Cal State East Bay, 3-1, on September 23 in Hayward. Kelsey McIntire slammed 13 kills and hit .320 on offense, but after holding a 2-0 lead in the match, the Sonoma State women's volleyball team surrendered the final three sets to lose to host Cal State Monterey Bay in five sets on September 24 at the Kelp Bed in Seaside. The Seawolves are now 4-6 and 2-1 in CCAA play. Sonoma State University defeated Cal State East Bay in four sets. Courtney Seda had a big night accumulating 45 assists on the team's 59 kills. Megan Bohorquez had 31 digs on the night. The Seawolves improved to 2-0 in the CCAA. Freshman Devin Gregg turned in his third-consecutive top 20 finish in eight days, firing an even-par 216 to lead the Sonoma State men's golf team to seventh place at this week's Western Washington Invitational at Bellingham Golf & Country Club in Washington. Gregg's rounds of 71, 73 and 72 were good enough to place him in 17th out of 95 golfers, just five strokes back of individual medalist Chris Crisologo of Simon Fraser University on September 27. Three Sonoma State men's golfers tied for 15th place with a five-over-par 147 effort on September 23-24 to lead the Seawolves to a fifth place standing out of 18 teams at the Saint Martin's Invitational at Olympia Golf and Country Club in Olympia, Washington.